Manga Tweeted last week, that Ghost In The Shell: Stand Alone Complex: Solid State Society will be released on Blu-ray in the UK in May 2012. This is the feature film that followed the two Stand Alone Complex Series, and which was released here on DVD some years ago, and which has subsequently been given the 3D upgrade in Japan. The Blu-ray won't be the 3D version. Manga also Facebooked last week in reply to a fan question. The Hetalia World Series … um, series will make its UK debut, also in May 2012, and will be followed by the Hetalia: Paint it White feature film in June. Manga Entertainment are also actively pursuing Clannad for UK release. As this is all Social Media wittering and prone to deletion, I'd treat it as somewhere between rumour and fact at this stage. You can't get much more concrete than an interview, and on last week's ANNCast, a couple of Funimation executives dropped some very tantalising hints for the forthcoming year. The next four volumes of Hellsing Ultimate, which are finally in the dubbing process right now, will be released in quick succession on Blu-ray as well as DVD, and there will most likely be a re-release of volumes 1-4 in boxset form on Blu-ray as well. They also mentioned that they have the Blu-ray rights for Black Lagoon, Seasons 1 and 2, and by implication the Roberta's Blood Trail OVAs as well. This is in the same week that listings appeared on a German e-tailer for Black Lagoon Seasons 1 and 2 Blu-rays courtesy of Kaze. Here's hoping that the UK won't be left out of this one. There are some titles that you think will be around forever, anime so important to the fans that the idea of it going out of print is simply ludicrous. And then it goes out of print. With Rightstuf announcing their 12 Days Of Christmas sale, they also slipped out the news that practically the biggest anime in the last 20 years, Neon Genesis Evangelion is finally going out of print. It's been that way in the UK ever since ADV died, but it would have been inconceivable for the same to happen in the US, as ADV's successor Sentai Filmworks had retained the rights. Also with the hype of the Rebuild Movies continually growing, you'd figure that demand for the original series would also remain high. But then there are the ongoing legal difficulties between ADV-Redux and Gainax, and reputedly Gainax are well aware of the value of their masterpiece, making re-licensing it a costly proposition. With the licence having lapsed, it may be easier for someone like Funimation to pick up the series, but just in case it doesn't happen, now may be the last chance to get a cheap import of the boxset in if you're one of the few that has never seen Neon Genesis Evangelion. Just the one anime review last week, and it was a blast from the past for me, as I took a look at a series that I passed on the first time around. Black Blood Brothers has a very retro feel to its design, and it is yet another vampire anime in a medium inundated with such shows. While its 'vampires living in harmony alongside humans on an island off Japan' premise is so reminiscent of the more recent Dance in The Vampire Bund that it hurts, there's something about an anime that doesn't rely on the sexualisation of a pre-pubescent female vampire to attract fans that appeals. On the other hand it is one of those vampire shows where the damsels get orgasmic at the very bite of a vampire's fangs, so we're firmly into Anne Rice territory here. Read more in my review. Thankfully, there's more to animation than just anime, and there were a couple more reviews this week to appeal to fans of the medium. First Stuart took a look at Magic Ball: The Complete Series 2, a vintage Cosgrove Hall children's series, on the same week that co-creator Mark Hall passed away. If you're of a certain age, you'll have fond memories of shows like Dangermouse, Count Duckula, Chorlton and the Wheelies. 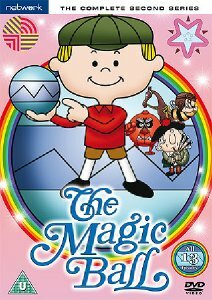 The Magic Ball is an award winning series, a little more vintage, that told the adventures had by a young boy named Sam, courtesy of his magic ball. 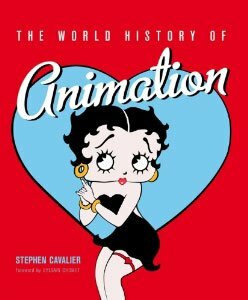 Then Si reviewed The World History of Animation, a book by Stephen Cavalier that takes the reader on a journey through film and television history, taking a look at how animation has developed over the years, in both cinema, on television, and most recently digitally, and looking at some of the various titles that have made their mark on society over the years. 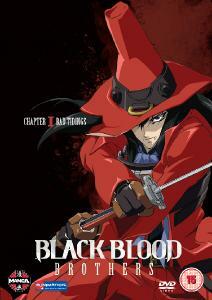 Manga Entertainment released Black Blood Brothers two logos ago, Network DVD released Magic Ball: The Complete Series 2, two weeks ago, and The World History of Animation is available from Aurum Press.